The final showdown nears between boy wizard Harry Potter (Daniel Radcliffe) and his nemesis Lord Voldemort (Ralph Fiennes) in the penultimate chapter of the franchise that has enlivened movie screens for nearly a decade. In splitting J.K. Rowling's final Potter novel into two movies, Warner Bros. may be operating from the mercenary (and understandable) desire to milk its cash cow, but whatever the studio's motives, it's a smart move. There is suspense and action but also room for emotion, and for the audience, a satisfying build up to next summer's grand finale. 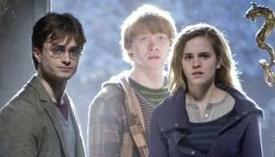 The minor miracle of the Potter franchise is that it has maintained its high quality through so many movies. This one is no different. The fans will turn out, some more than once. Expect happy box office returns. Familiar faces here include Professor Severus Snape (Alan Rickman), Hagrid (Robbie Coltrane) and Alastor Moody (Brendan Gleeson). Even the late Professor Albus Dumbledore (Michael Gambon) makes an appearance. But these are cameos. With Voldemort consolidating his power and Harry declared "Undesirable #1," the world's been whittled down from the clutter of Hogwarts. Harry and friends Hermione Granger (Emma Watson) and Ron Weasley (Rupert Grint) move to protect their loved ones by separating themselves; it's three 17 year olds against an increasingly hostile world. The story begins in melancholy. School is behind Harry and pals, while in front of them is danger and maybe death. An early chase sequence adds a jolt of adrenaline, but the overall tone is one of quiet menace as Harry embarks on a quest to find and destroy the Horcruxes that are the source of Voldemort's immortality. The pursuit leads to the Ministry of Magic, now controlled by Voldemort who's taking a cue from Nazi Germany with a campaign against muggles and wizards with muggle blood. But there are also long, often quiet sequences in the woods where danger lurks both without and within. As if the much talked about kiss between Harry and Hermione weren't enough to convince us the trio are now young adults, sexual jealousy also arises as the three share tight quarters. Director David Yates, helming his third Potter installment after Harry Potter and the Order of the Phoenix and Harry Potter and the Half-Blood Prince, mixes things up by adding a delightful animated sequence that explicates the legend of the Deathly Hallows. The film might have ended at its action-packed and ultimately moving climax, but screenwriter Steve Kloves goes one step farther. He finds the perfect cliffhanger, one that emphasizes just how dangerous young Mr. Potter's situation really is and definitely leaves the audience anxious for the next chapter. The downside to all this is that Part II is one of next summer's tentpoles, a long eight months away. Rating: PG-13 for some sequences of intense action violence, frightening images and brief sensuality.